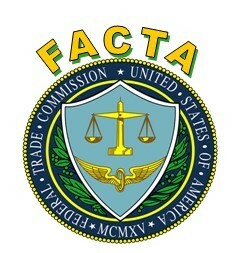 FACTA is the Fair and Accurate Credit Transaction Act of 2003 which is an amendment to FRCA. It is a federal consumer rights law that amended the Fair Credit Reporting Act of 1970. Its primary purpose is to reduce risk of identity theft by regulating how consumer account information ( such as Social Security Numbers) are handled. FERPA is the Family Educational and Privacy Act. It is a Federal law that gives parents certain protections with regards to their children's educational records, such as report cards, transcripts, disciplinary records, contact and family information, and class schedules. HITECH Act, The Health Technology for Economic and Clinical Health Act was enacted as part of American Recovery & Reinvestment Act of 2009, and signed into law on February 17, 2009 to promote the adoption and meaningful use of health information. HIPPA, Health Insurance Portability & Accountability Act sets the standard for protecting sensitive patient data. Any company that deals with protected health information (PHI) must ensure that all the required physical, network and process security measures are in place and followed. The GLBA Act is also known as the Financial Moderization Act of 1999. It is the United States Federal law that requires institutions to explain how they share and protect their customers' private information. ​All businesses, professions and government agencies, regardless of size, are now federally and state mandated to properly dispose of confidential information. Prevent lawsuits and heavy penalties by not violating these laws! Stay compliant with these policies with our qualified services. The cost is much lower than a violation!